COLORADO SPRINGS, Colo. — USA Triathlon today named four elite paratriathletes — two women and two men — to the first-ever USA Paratriathlon Resident Athlete Program at the U.S. Olympic Training Center in Colorado Springs. The team, composed of Allysa Seely (Glendale, Ariz.), Hailey Danz (Chicago, Ill.), Mohamed Lahna (Elk Grove, Calif.) and Howie Sanborn, (Denver, Colo.) will begin formally training on April 1, with USA Triathlon Level I Certified Coach Derick Williamson (Colorado Springs, Colo.) serving as head coach. The USA Paratriathlon Resident Athlete Program is the fifth Paralympic resident sport program to call the Colorado Springs facility home. The program will remain in operation through the Tokyo 2020 Paralympic Games. As part of the resident team, athletes will have full access to Olympic Training Center amenities, including workout facilities, nutritional counseling, sport science testing and sport psychology sessions. Athletes will be eligible to receive financial support to compete in national and international competitions, and will receive regular individual and group coaching from Williamson and Olympic Training Center strength and conditioning staff. In addition, athletes will have the opportunity to receive media training and take part in community engagement and service opportunities around Colorado Springs. Seely and Danz made history in paratriathlon’s debut at the Rio 2016 Paralympic Games, earning gold and bronze medals respectively in a U.S. podium sweep of the women’s PT2 class with bronze medalist Melissa Stockwell. 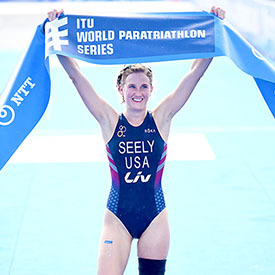 Seely’s paratriathlon resume also includes the 2015 and 2016 ITU Paratriathlon World Championship titles and 2017 world silver medal, as well as 11 medals in ITU World Paratriathlon events. Danz’s credentials include the 2013 ITU Paratriathlon World Championship title, 2014 and 2015 world silver medals, a 2017 USA Paratriathlon national title and six ITU World Paratriathlon event podiums. Lahna represented Morocco from 2010-2016, and currently competes in the neutral ITU jersey. He will officially represent the U.S. beginning in 2019. Lahna earned a bronze medal for Morocco in the men’s PT2 class at the Rio 2016 Paralympic Games, was the world silver medalist in 2011 and owns eight medals in ITU World Paratriathlon events. Sanborn is the defending national champion in the men’s PTWC class. He won his first ITU Paratriathlon World Cup medal, a gold, in Magog last July, and is a 2014 ITU World Paratriathlon event silver medalist. Click here for more details about the launch of the inaugural USA Paratriathlon Resident Athlete Program. For more information about paratriathlon at the grassroots and elite levels, visit usaparatriathlon.org or contact Duke Boulet at Amanda.duke@usatriathlon.org.